Author Craig Bowlsby rushed me a copy of his new book Empire of Ice. 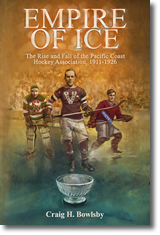 The Rise and Fall of the Pacific Coast Hockey Association, 1911-1926. I've barely made a dent in this 400 page text but I have to tell you about it. This is a fantastic book for those interested in some real hockey history. This book does have a bit of a niche audience. Many of today's fans have never heard of the Pacific Coast Hockey Association. Or the Patrick brothers, and their immense legacy on the hockey world to this very day. Heck, a lot of fans don't even realize that Vancouver really has won a Stanley Cup. So has Seattle, and Victoria for that matter, too. As a hockey history nut with a particular interest in hockey's development in Western Canada and in the Patrick family, I can attest that this book is impressive. I knew it was thick at over 400 pages (including 70 black and white photos) but I did not really know quite what to expect. I feared it would be dry and academic, like some of the writing on this topic before, but I was dead wrong. This is a wonderfully written book. It is a history text book - the most comprehensive history text book of the PCHA ever written. But storytelling is very much a part of Bowlsby's presentation, making this book a wonderful surprise that I can't put down. Seeing that this book is essentially self published I wanted to get the word out there as quick as possible. I have not read the entire book yet, but it certainly passes my first glance test with flying colours. Simply put - I can't put it down. Perhaps it is in part because I have always had a curious fascination with the PCHA and the Patrick brothers in particular. There have been other books on the topic but none have captured my attention like this one has. I think that is largely due to the author's writing but more importantly his passion. You can tell early on that this is a labour of love for Bowlsby and he instantly gains respect from the reader. The PCHA rose and fell like the Roman Empire, but left its own mark on history. Now fans can re-live how the Patrick Brothers invented modern hockey, and brought the highest level of the game to the Pacific Coast, and to the world. This legendary league has never, until now, been comprehensively recorded. Craig H. Bowlsby has unearthed much new information. He has debunked common misconceptions, and even solved many mysteries. Empire of Ice chronicles the rise of the PCHA to the pinnacle of its success, and then to its final, bizarre plummet. All the league’s exciting Stanley Cup struggles are described in detail, as well as the trials, experiments and scandals of the regular seasons. This brings to new light the techniques and exploits of the great hockey stars of both West and East. Cyclone Taylor, Frank and Lester Patrick, Hugh Lehman, Moose Johnson, Frank Nighbor, Eddie Gerard, Nels Stewart, and many others, are spotlighted. The PCHA also created the first American teams to fight for the Stanley Cup, and the stories of Seattle, Portland and Spokane are fascinating ones. As well, fans can read how the teams of both the NHL and the Prairies clashed with the Pacific Coast in search of the Stanley Cup. There is much new information about Montreal, Ottawa, Toronto, Quebec, Saskatoon, Regina, Calgary, and Edmonton. A cornucopia of statistics is provided for those who relish in-depth comparisons. For all the drama, and for one of the freshest views of hockey history ever published—read on! Bottom line - this is an excellent and comprehensive hockey history book. The book will probably fly under the radar to some degree as it does not have a major publishing marketing machine behind it. Do not overlook this book. You can also order the book through the author's email – epic@intergate.ca or through Ebay as a fixed price item. It’s also available at all Black Bond book stores, Hager’s Books, MaCleod’s books, Munro’s Books in Victoria and Aquila Books in Calgary. Totally agree Joe. I met Craig at the big Langley collectables show a few weeks ago, and also can't put the book down. Had a good chat with him and wish him luck, this book deserves to be widely-released.